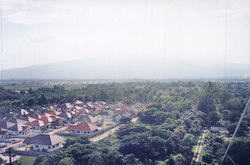 Chiang Mai sits in a fertile basin surrounded by mountains. My QTH is approximately 5Klm towards the Western side. 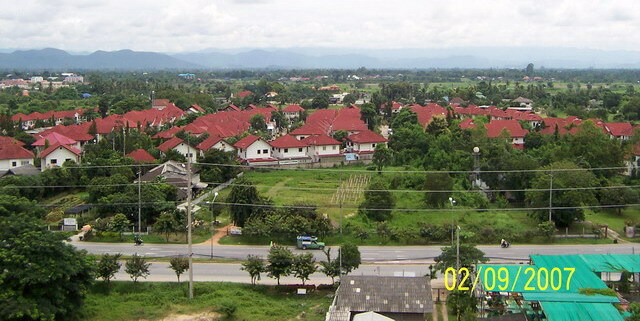 The picture taken looking east from the top of the tower shows local housing estates and the mountains to the East rim in the background. 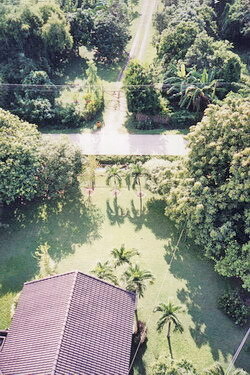 View of the front garden from atop of the tower approximately 37 meters above ground. 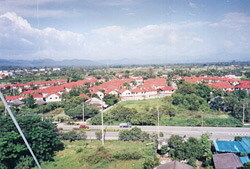 The bungalow roof is to the bottom left. The property line is up to the roadway running across the center. The next picture down, if you follow the road is a continuation into the distance. Looking West, the road running center is on private land where fruit tree are grown for commercial sale. A white fiber glass spreader arm with wire attached is top center which is part of the quad antenna. Looking almost straight down the mast. 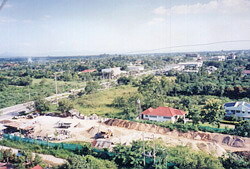 The perimeter wall can be seen to the left and center. 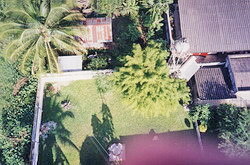 The mast is situated on the corner side of the bungalow so is approximately one quarter of the property picture wise. This is the mountain to the west of me which I believe is responsible for poor reception from the African continent. Due to the excepted and unstoppable practice of burning everything from garbage to field fires the mountain is all but invisible most of the year round. Monsoon rains tends to make visibility better for only a few days per year. 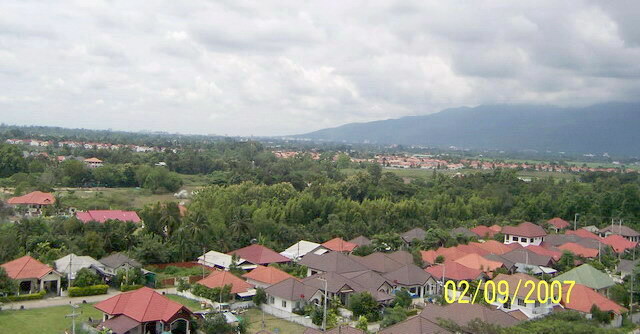 The mountains range can still be seen looking south east, in the background but towards the South are further away. 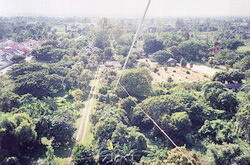 The following new pictures where takes just below the quad antenna approximate height 30 meters, during a maintenance visit in September 2007. 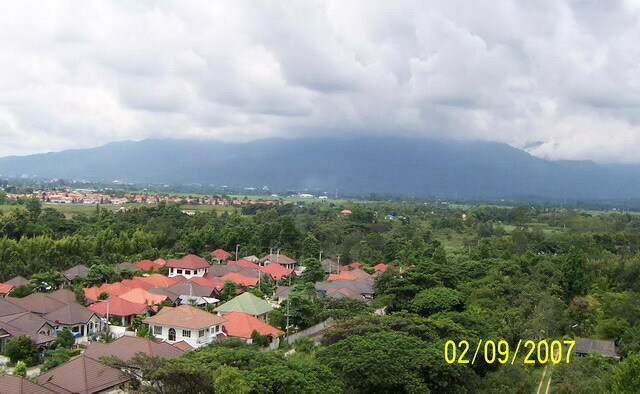 As this is near the end of our rainy season the visibility is about as good as it gets, due to air pollution. 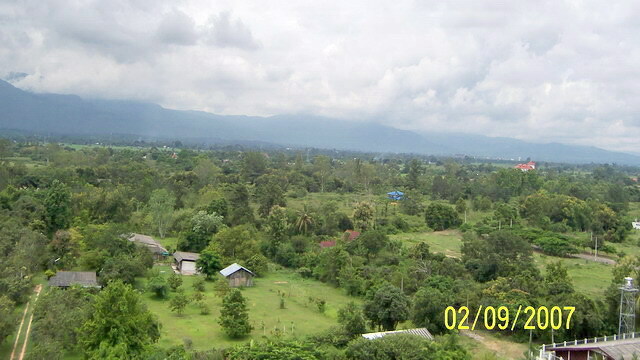 Chiang Mai is surrounded by mountain, but otherwise is completely flat. The apparent slant in most pictures is due to camera parallel distortion. A beautiful location. 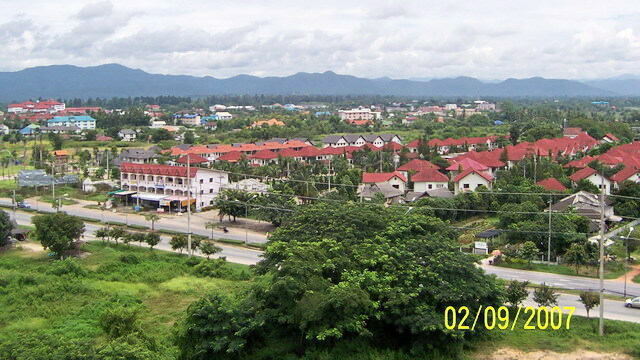 Towards Chiang Mai city center. Cell phone tower center right. 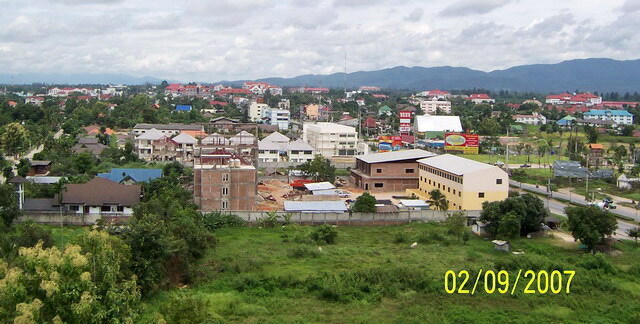 Many towers on skyline. Looking almost due South. Same as above picture but slightly to the West.